Descriptive Thesaurus & Dictionary, crossword help and fully featured Word Processor. Extensive structured data provides a reference tool which is far superior to that provided in most of the 'popular/expensive' Word processors. Searching for synonyms, antonyms, holonyms, meronyms produces all sense descriptions for the selected word, or simply, just explains the meaning of a word with an example sentence of its use. Has Help, Tips & Tutorials. TheDict4Me is descriptive Thesaurus & Dictionary, crossword help and full WP. Extensive structured data provides a reference/research tool which is far superior to that provided in most of the 'popular/expensive' Word processors. Searching for synonyms, antonyms, holonyms, meronyms produces all sense descriptions for the selected word, or simply, just explains the meaning of a word with an example sentence of its use. The fully featured word processor section of the program has a number of novel features and can accomodate most peoples needs including those of a university student/post graduate. 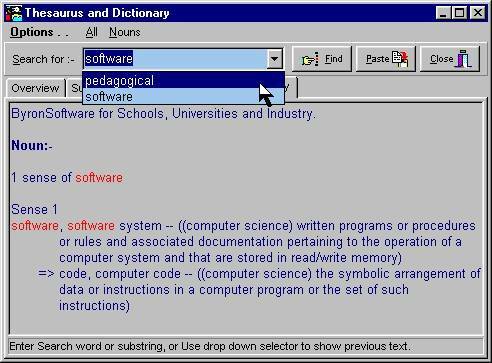 TheDict4Me program can use any PC registered text convertor (eg .doc) so Word and other text processed documents can be used. Qweas is providing links to TheDict4Me 4.55.23 as a courtesy, and makes no representations regarding TheDict4Me or any other applications or any information related thereto. Any questions, complaints or claims regarding this application TheDict4Me 4.55.23 must be directed to the appropriate software vendor. You may click the publisher link of TheDict4Me on the top of this page to get more details about the vendor.